I loved Pole Position in the heyday of arcades, but the menacing additions of Spy Hunter gave car racing just what I loved most - more shooting. My craving for space shooters could never be met, but the somewhat similar horizontal shooter aspect of Spy Hunter necessitated many quarters being dropped. As always, the NES was a great system to coincide with the arcade era by nature of nicely replicating many arcade titles better than any system to date. Alas, Spy Hunter was poorly ported and lacked the flow of other ports. All of my Spy Hunter experiences were with upright cabinets, so I was surprised to encounter this flyer with a sit-in design. I always vowed that when I bought a car, it would have a Spy Hunter style steering wheel. 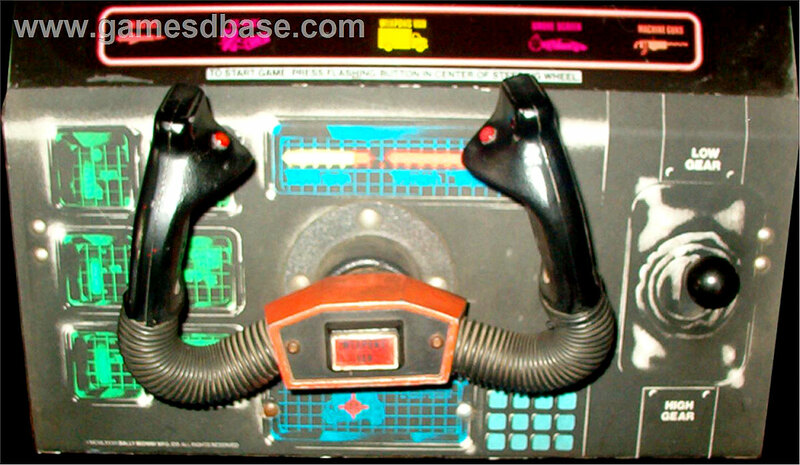 Alas, that never happened, but the Spy Hunter arcade controls were wonderfully unique compared to other racing cabinets. You can bet I had Spy Hunter on the 2600, but the added buttons of the NES gave more control options. 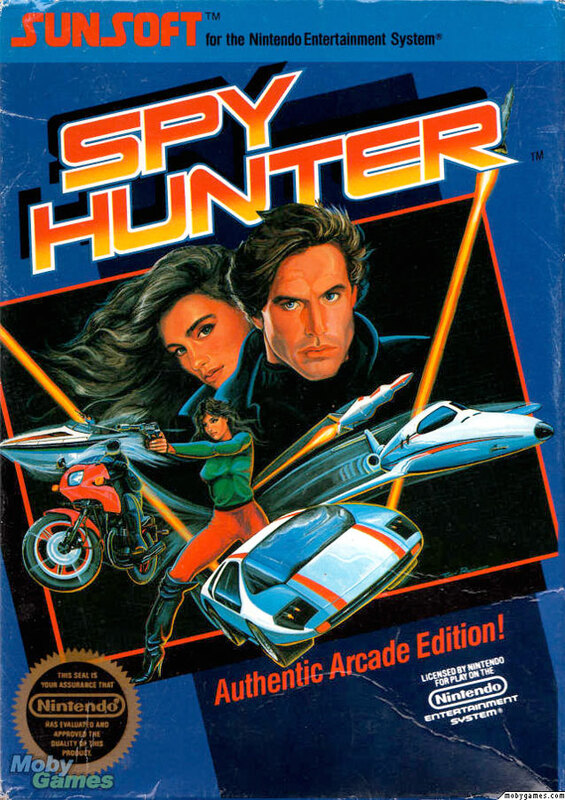 I always likened this game to Pole Position, but Spy Hunter really isn't a racing game. It's almost a horizontal shooter on rails with racing elements. Your elite car is armed with state-of-the-art weapons that will be needed to take on the variety of enemies - both on the track, in the air and on water. With tire-slashing cars, torpedoes and bomb-dropping helicopters you'll have your work cut out for you. To battle your enemies, your car is equipped with twin machine guns and a host of weapons you'll garner as you progress. You'll have smoke screens, oil slick releases and heat-seeking missiles to battle your enemies. With all these advanced weapons, I still find that I get run off the road more often than anything else. 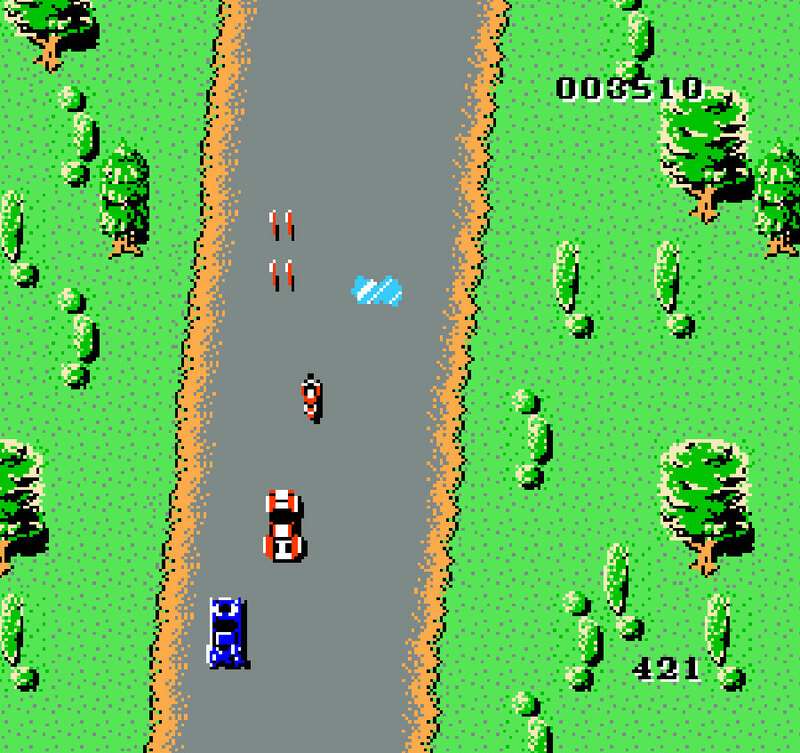 was ported to several home game consoles and computers for DOS, NES, Atari 2600, Atari 8-bit computers, Amstrad CPC, ZX Spectrum, Commodore 64, Apple II, ColecoVision, and BBC Micro. Lets just say the thrill of the arcade becomes an act of frustration on this home release for the NES. Many aspects of Spy Hunter are incorporated, but the collision detection is kind of whacky. things that don't touch you suddenly knock you off the road. But my prime complaint is the speed settings. It seems as though you go from too slow (enemies easily creep up on you) to way too fast where you are hard pressed not to run into everything! I've read about some really crazy bugs online. 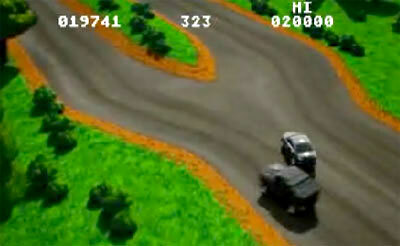 One scenario discusses certain actions would result in the car reappearing on-screen but none of the weapons function. It's strange that so many bugs have been reported on the NES version, mostly because it was released on several home consoles and computers without major bug reports. The above image is from the Spy Hunter game manual. No expenses were spared here - lol. With these terrible images and very scant info, the Spy Hunter manual really offers little information that 3 minutes of game play wouldn't reveal. brings back many arcade memories, but the game play is far more frustrating. 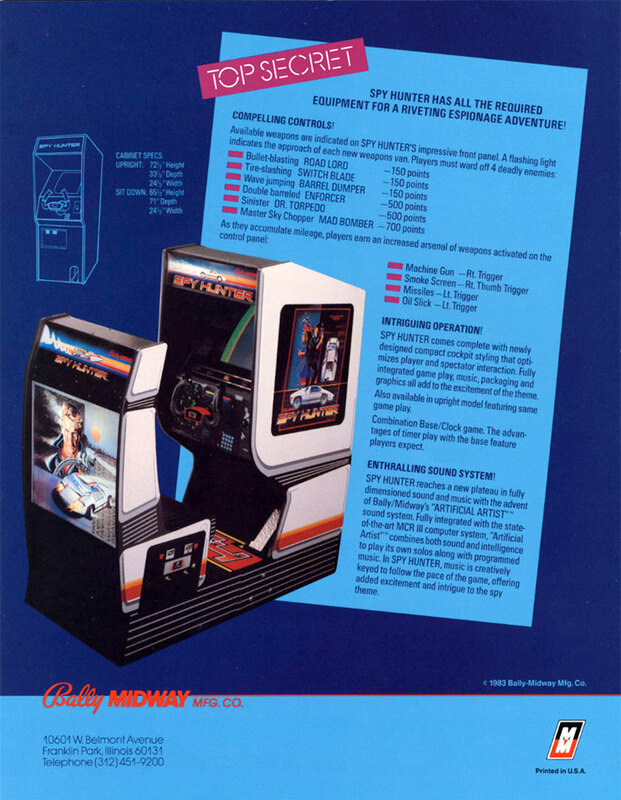 Between odd speed variants and random bugs in this version, the arcade version is far preferable. We love Spy Hunter, and the NES version offers a good version of it, but the bugs make it far less desirable than it should be.